Hello kings & queens! 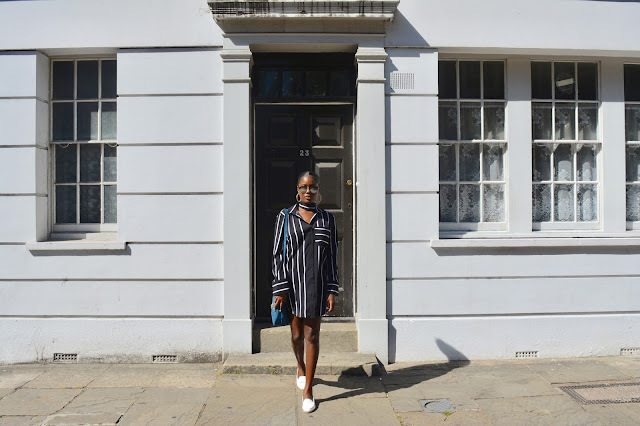 Today’s post is a bit random with a little life lesson and of course fashion but I needed to get a few things off my chest and I figured a lot of you can relate to these struggles because at the end of the day fashion, beauty, travel etc. is all great but its not a constant reality. Hardships, struggles and failure occur to all of us and we all struggle so as much as I adore fashion and all of the above, we are all constantly going through our own battles and the more we realise that life comes with challenges and we all face them the more we will all come to the realisation that we have a lot in common even with the bigger bloggers, youtubers and other social media influencers. I went out with one of my really good friends Check out Micah's amazing Blog which made me forget all the ‘problems’ I think I have. We ate, did a photo-shoot and lots of talking in Starbucks but most importantly it took my mind of the current state I am in which is the feeling of failure. I just want to mention that I know my problems/ our problems are so minute in comparison to all the terrible things happening in the world. Someone out there wants what you have and is going through much worse but the truth is we are all human and its ok to feel down, upset and just ‘in your feelings’ as I like to say. I don’t want to bore you but to sum everything up, I am in a current state where I feel like I am constantly failing. It almost like anything that can possibly go wrong will go wrong and I’m constantly losing! This is for a number reasons but I’m sure im not the only one but I wanted put this out there because not everything you see is reality and this is the case for a lot of us. If you are currently in this state, remember that it is only short-lived and it will get better. We are each on our own journey so although it may feel like everyone around you is winning at life, that’s because its their journey not yours. It is a temporary feeling so run your own race, no need to compete or compare. Now let’s talk fashion! This outfit makes me so happy because everything is from the high-street. Shirt Dress: Surprisingly enough I purchased this shirt dress from boohoo.com. I say surprisingly because for the longest time I have always said its not my favourite store. Not because I didn’t like their clothing but because majority of the time I felt like what was shown online was often different to what you receive. For example, I’m not one to look at material, if it looks good I’ll take it! But with boohoo, the material to me personally is never that great and for some strange reason, a lot of their clothing is jersey or ribbed. This would really annoy me because I would have such high expectations. I guess its partly my fault for not looking at the material but I don’t have this problem with Asos or urban outfitters. That being said, they are very affordable as many of you must already know. Now back to the dress. I love it! It was perfect for the warm weather because it was so lightweight so even though I was wearing a long sleeved dress in 24 degree (Celsius) weather, it was very breathable. I absolutely adore the choker detailing as it gave the dress a special touch. The best part is that it was only £12! I love a good bargain. 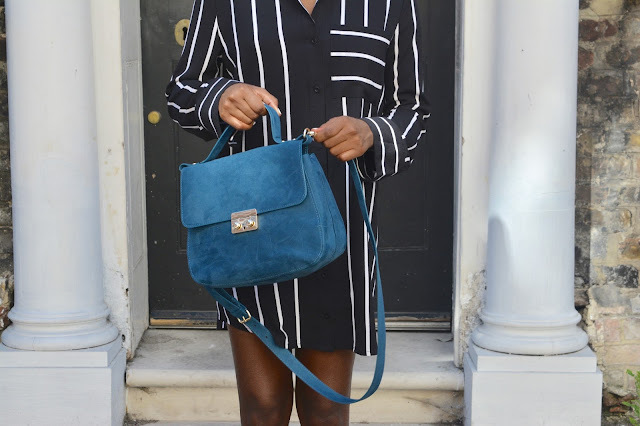 Bag - I decided to rock the Zara city bag in sky blue although it looks more teal/turquoise. Since I was wearing a monochrome dress and it is summer, I thought I needed to add some colour to spice up the outfit. Its not a super bright bag, but just the right amount of bright to jazz up the outfit. The city bag comes with a removable strap and you can see from the pictures that I take it on and off just to show you how it looks with our without. If your looking for an affordable, fashionable, on trend bag I would definitely recommend Zara. They always seem to have a dupe for luxury brands which is essential for someone like me who doesn’t want to fork thousands on a trendy bag. The only downfall is that they change their stock often, so if you see a bad that you like I suggest you grab it with both hands. I can’t tell you how many times I’ll have my eye on a bag and then it mysteriously goes. 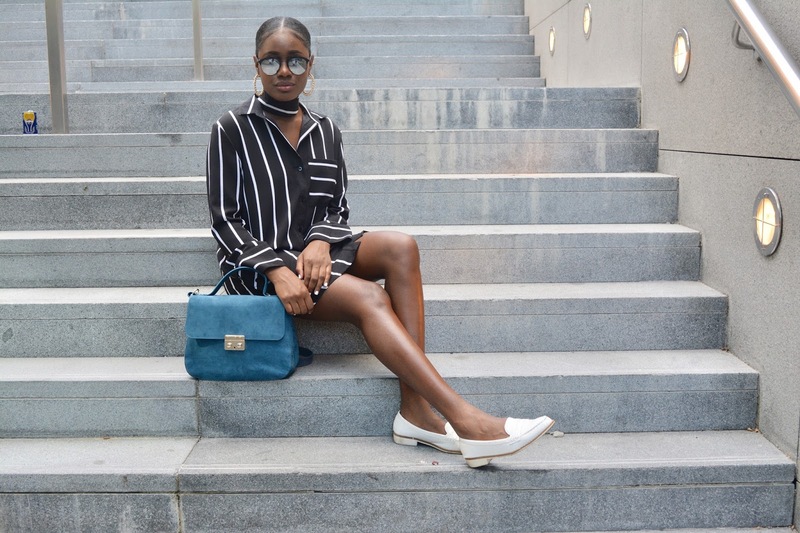 Shoes - I paired this shirt dress with white loafers just to keep it casual. I have a thing for white flats maybe because I like the contrast between white and my chocolate skin. I purchased these from loveclothing.com awhile back but unfortunately their site has closed down. On the plus side, you could probably get something similar from any other high street store. Accessories: Since, the dress came with the neck accessory, I didn’t feel the need to pair it with a necklace. I did however wear these hooped earrings from urban outfitters which is sort of a big deal because I am pretty safe when it comes to earrings and typically wear studs or small hooped earrings but I am so happy that I went outside my comfort zone because I think they went so well with the outfit. They did initially feel heavy but I quickly got used to them. Last but not least are these Steve madden sunglasses. Now I know Steve madden is expensive but I purchased these from TK Maxx for £12. I sadly do not have a link to where you can purchase these from because I picked them up in the store and if you know anything about TK Maxx, you would know that what they have online is often different to what they have in store so I’d suggest you go in store and pick up a bomb pair of designer sunglasses for under £20! 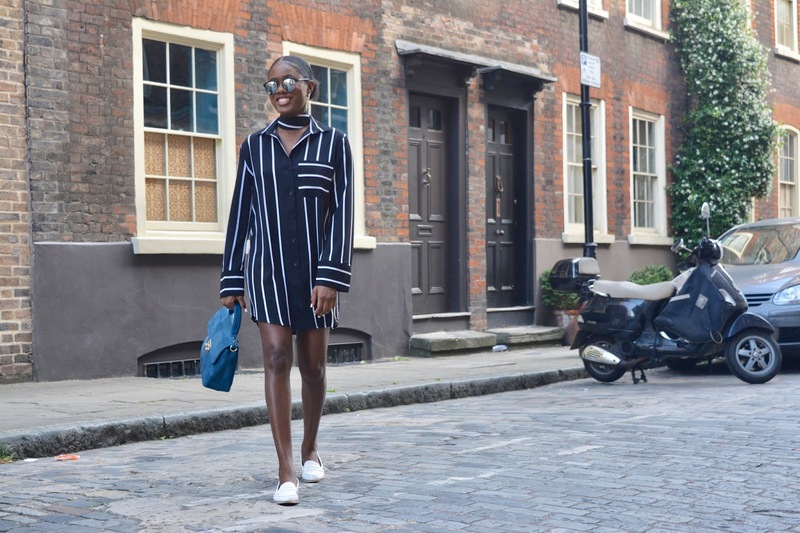 What is your favourite high street brand? 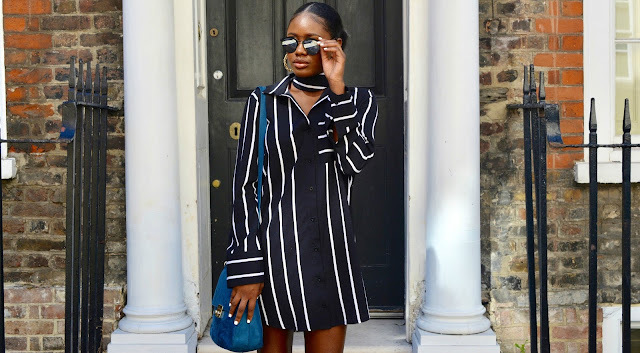 in love with that shirt dress, suits you perfectly girl! You look beautiful and I love how true you are! 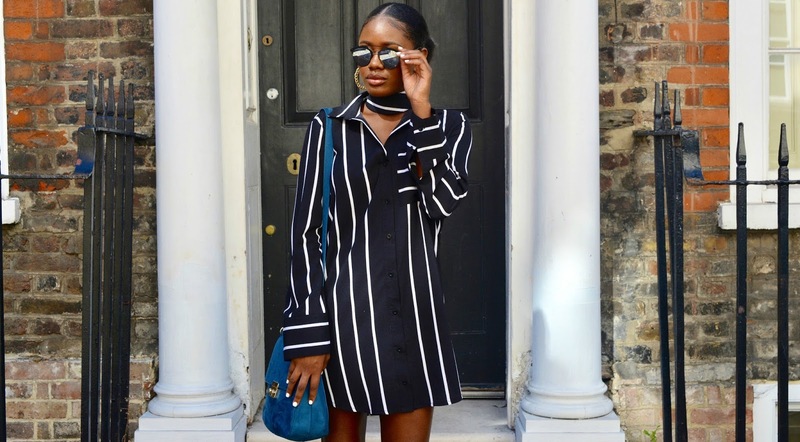 This shirt dress is absolutely perfect! You're so fashionable! I loved looking at the photos! Such a lovely shirt dress and perfect accessories! You are such a stunner!